Maxwell House Master Blend Office Coffee. When it comes to satisfying a large, diverse group of coffee drinkers, Maxwell House Master Blend in the coffee service pack has no equal. 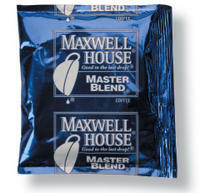 Maxwell House is a Kraft/ General Foods product and is the favorite with some of our staff. 42 Individual, Full Pot Packages per case. Each package contains 1.25 oz of Maxwell House Master Blend Coffee.